Hand Stamped By Heather Wright-Porto: It's a Sketch Challenge and NO Stamping! It's a Sketch Challenge and NO Stamping! Good morning stampers! Today, we have a Sketch Challenge! Use any colors, any stamps...but use this layout to spark your creativity! I also used last week's color combo and using the same DSP too!!! So you get 2 in 1! Guess what? There is NO STAMPING for this one! Yup, that's right! AND you can create it in 10 minutes or less! Whooo hoooo!!!!! So grab your favorite DSP, framelits or punches and let's get started! It's a bunch of layers and die cuts (or punches), accessorize, and you'll be done in no time! Card base is Whisper White (4-1/4 x 5-1/2 vertical card). Then adhere a piece of Crumb Cake ( 4 x 5-1/4) using SNAIL Adhesive. Cut a 1-1/2 x 5-1/4 piece of Rose Red DSP and mat it with Rose Red. Adhere to Crumb Cake using SNAIL Adhesive. Cut a piece of Garden Green DSP and cut the corner. This piece starts at 3 x 2. Wrap some Linen Thread around the bottom. Adhere to card front using SNAIL Adhesive. Die cut your flowers, circles, butterflies and adhere using Stampin' Dimensionals to give the card some dimension. I used "Celebrate" from Expressions Natural Elements for the greeting. 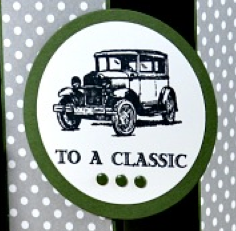 Sandi has already loaded 2 projects for our May Card Class...it's Masculine Cards! Here's a sneak peek! And this one is a fun fold card too! Come on over to Stamping and Blogging -- get started today! 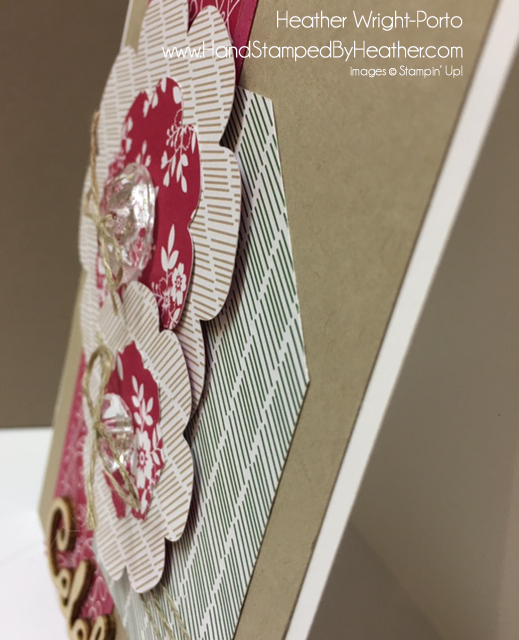 And don't forget to get your free Stamping 101: The Basics stamping video series! Cute card , Heather, and I love the quick and easy part! It's great to have a card come together quickly with such fun results! wow, all that and no stamping, that's cool. I love all the layers and how you placed the designer paper, it turned out absolutely stunning!....and that little wooden sentiment is the perfect touch!. It always amazes me how different a card can look even when you repeat the same paper combo. 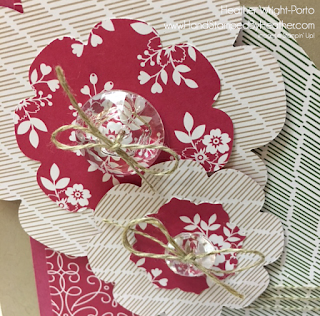 Great idea and think it is neat that you made a card with no stamping, turned out wonderful. Such a country feel to this card. Almost looks like a quilt. Very nice Heather. Great choice on the papers.